It's important to recognize that funerals are for the living. They allow us to recognize a life that was lived and acknowledge that the life has come to an end. The funeral declares that a death has occurred. It commemorates the life that has been lived, and offers family and friends the opportunity to pay tribute to their loved one. The funeral is a rite of passage by which we recognize as an important event that distinguishes our lives. Influences such as religious and cultural traditions, cost concerns and personal preferences make each funeral unique. At the Barnett Funeral Home, we want to help you create the most meaningful ways of offering tribute to the life of a loved one. We take the worry out of completing insurance forms, pensions, VA, Social Security and others off your mind when your loved one is gone. We are very experienced with the unique paperwork that is associated with losing a loved one. We will also make the necessary contacts for any claims that must be filed saving you time and sometimes frustration and confusion. As a full service funeral home, we are able to meet the needs of every family we serve, regardless of type of service chosen, faith, or tradition. Our spacious home is beautifully and carefully designed with the comfort of our families and their guests in mind. There is ample seating available, and our home is able to accommodate all types of services. We also have a full range of quality selections and merchandise for our families to create truly special and memorable services. This is a general overview of the various services we offer; we understand that you may have additional questions. Should you desire more information about our services, we encourage you to contact us directly at (814) 486-0369. In most cases the funeral will be a Traditional Funeral Service. This includes a family or public viewing of the deceased. Following this will be a service, typically in the church or at the funeral home. This would be followed by the burial of the casketed remains. This service will be just like a Traditional Funeral Service except cremation will follow instead of the casketed burial. 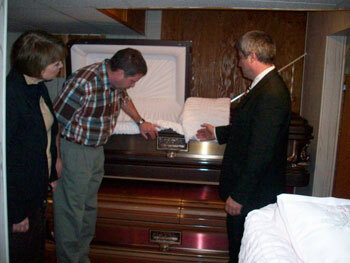 This can be accommodated by the use of a rental casket. Following the viewing, service or ceremony, and eventual cremation, the cremated remains can be buried, properly scattered, made into a diamond through LifeGem: www.lifegem.com or returned to the family for safe keeping. People who prefer not to have any service or gathering can contact the funeral director for transportation, obituaries, filing the death certificate, coordination of grave opening/closing, disposition permit and any other authorizations or need.